Happy New Year to all of my followers - Wishing you many fun and exciting fishing trips! 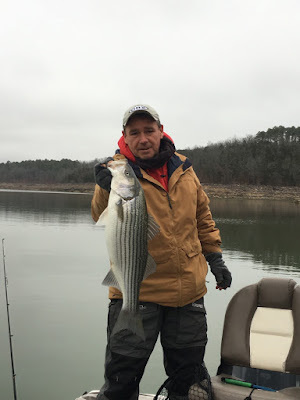 Norfork Lake's fish have moved to their winter time pattern. The lake water temperature this morning has dropped to 44.5 - 45.5 degrees in the main lake (near our resort) and cooler back in the shallower creeks and coves. With the drop in lake water temperature, shad tend to move to deep water. I have been marking a lot of bait in the main river channel predominantly 30 - 40 ft deep in 70 - 100+ feet of water. I also checked out some flats and the bait typically started to show up when I got to 40 - 45 feet of water and was suspended from 30 feet to the bottom. It has been a while since I last reported, and has actually been a couple weeks since I have been on the lake. My wife and I visited our grandkids in Texas over the holidays, but I am finally back fishing Norfork Lake. Over the last two days I spent a lot of time looking and graphing to see what the bait and fish have been doing. I mainly have been searching for striped and hybrid bass. Yesterday (Monday 1/8) I headed east out of our resort to the bridges. This is typically a great winter time place to catch striped bass. I marked some bait, but very few fish. I then checked north of the bridges and found bait in the mouth of the cove near 101 boat dock, but was not marking many fish. With the amount of bait in this area there will be fish there very soon. Of course I checked out several areas between our resort and the 101 Boat Dock area, but nothing I saw was very exciting at this time. A friend told me he had been trolling and catching stripers north of Cranfield, so I headed back towards our resort and went up river. Again I found bait, but this time I also marked fish. No schools, but a lot of 2 to 3 fish swimming together fairly consistently. I started fishing in about 50 feet of water in the mouths of several coves. I was vertical jigging with a 1 ounce spoon and found fish suspended 30 feet down. I spooned up a nice hybrid and a striped bass. I then headed over to the river channel and started to head up river a little farther. I found bait 40 feet down in 80 feet of water and started marking fish on top of the bait so I started spooning again. I got 4 big pull downs, but missed them all. I guess I need to practice more on my hook setting technique for these deep water fish. :-) The fish were actually inside of the bait. 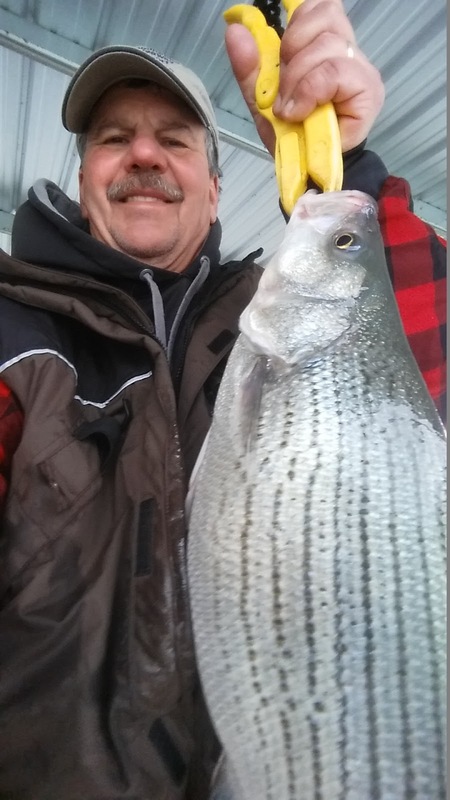 I had some guests fishing the same area, but slightly farther north in the channel and they landed 3 nice stripers with one over 20 pounds. My guests were using live shiners set at about 30 feet down. This morning I headed back towards Cranfield and checked out several other areas, but ended up in the river channel and again found fish buried inside of the bait 40 feet down, but I had the same results as yesterday, 5 great hits, but missed them all. Guess I will get them next time. 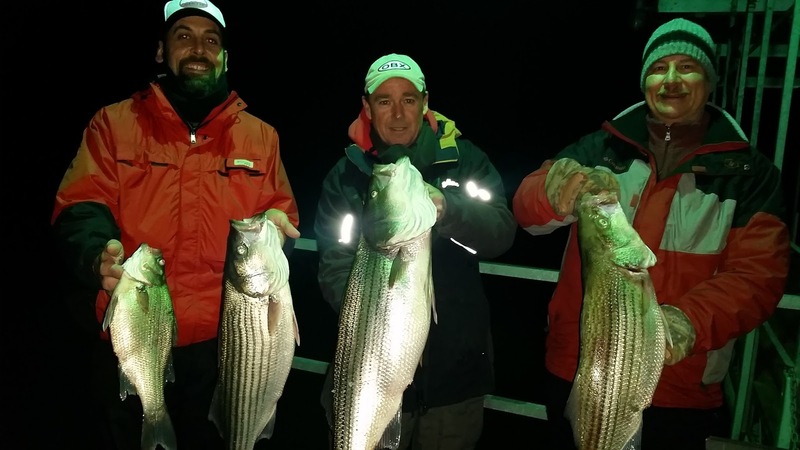 There are 3 very good methods of winter time fishing for striped bass. Vertical jigging with a spoon is one fun method and a big thrill. You will be jigging the spoon up and down and all of sudden the rod decides it does not want to jig up and gets buried. Make sure you are holding on tight. One important tip for winter time jigging is to slow down your presentation. Small twitches of your rod tip typically works better than the fast and large pull ups. 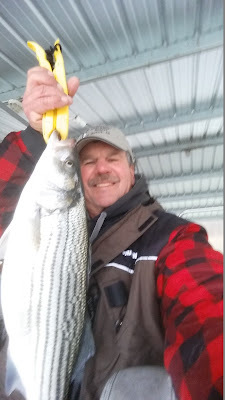 Live bait fishing is another good method to catch stripers. All you need is live brooder shiners, a 2 ounce weight tied to your line with a 3 - 4 foot leader, and a number 4 to a number 1 size hook. I try to match my hook size to the size of bait I am using. Set your bait right at the top of the bait you are marking, fish will come up for the bait, but typically will not go down after it. The third method that is currently working really well for some is trolling an umbrella or alabama rig. When I troll I like to use 5 inch swim baits (Reaction Innovation's Skinny Dippers are one of my favorites). You will need to get your bait down to a 20 - 35 feet depth. Down riggers are the easiest method to get your bait down deep, but you can also use weighted umbrella rigs or you can use in-line weights. I have not fished for bass or crappie yet, but will shortly. I did notice yesterday morning, as I was heading out about 7:30AM, that there were a few fish coming up next to the bank. They looked small, but sometimes it is hard to tell. Might want to check out a jerk bait. Typically the bass that I catch this time of year are in deeper water 30 - 50 feet down on the bottom close or near brush. The Norfork Lake level is falling slowly and currently sits at 547.86. The surface water temperature this morning was 44.5 - 45.5 degrees. The lake is stained.